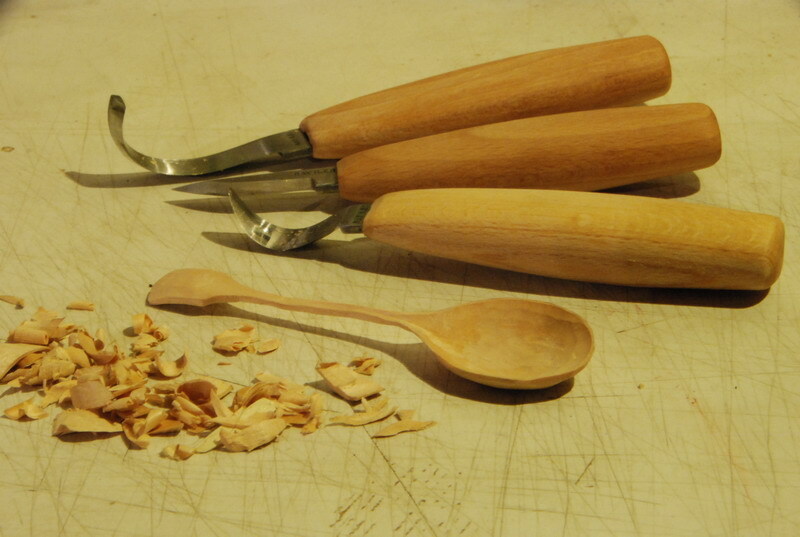 Spoonerism - spoon carving knives - get it? Oh well never mind. What you definitely should get is a set of these wonderful new spoon carving knives from Ray Iles. I've only had a brief play so far, but when it comes to a tool that you work so intimately with as a spoon carving knife, starry eyed love at first sight is a pretty good starting point. Let's begin with the handles. Plain double turned beech ovals, but the belly is offset towards the rear, so it nestles under the middle and ring fingers before narrowing again for the little finger - hand shaped in other words. Towards the business end, the handle narrows in thickness to a slender lozenge cross section, making your index finger very 'aware' of the exact angle of the blade and able to alter it very precisely by squeezing or relaxing the grip. Next the blades, hand forged O1, a material Ray has been using for most of his working life, tempered to RC59-61, hollow ground bevels, polished to a shaving sharp edge. I'm wondering whether I wouldn't be happier with a left bevel crook knife as I'd kinda prefer to use this beastie away from my body - maybe I'm just not used to it yet? If you are used to Moras the first thing you will notice is how much thicker the blades are (3mm). The whittling knife and the spoon knife have rounded backs so you can comfortably lay a thumb or fingertip on the back of the blade for very fine control. These two factors make a world of difference. I'm sitting here with a lap full of boxwood shavings, alternating between carving, typing, and watching in amazement as the best teaspoon I have ever carved appears before my eyes. It feels like I have swapped hands with Jon Mac! Lastly the bit that normally gets forgotten - the tang. The balance on these knives is just beautiful. All of them balance, as they should, slightly forward of the centre of the palm. The barest fraction of weight bias toward the blade gives the necessary registration, but keeping it as small as possible keeps fatigue to a minimum so you can carve in comfort for longer. 'Full length tang' is often touted as a selling feature, but a 3/4 tang that has been balanced to give perfect weight distribution trumps it by a country mile in my book. Ray has been making tools from the moment he could pick up a hammer, he was one of the last people to be apprenticed to the little mesters of Sheffield and is possibly the only man alive to have apprenticed under them as a Smith, Grinder and Cutler - three apprenticeships - now that's deciding on a career. The jump from making things that are sharp on the end to making things that are sharp on the sides is quite a leap for a toolmaker, but I am so impressed with these that I have decided to stock almost his entire range on the new website. Oops - nearly forgot, no photos - didn't happen. Here's the finished spoon, could probably be improved with a bit of sanding but hopefully not too shabby for a first effort. Wonderfull, I'm interest in these tools. Thak you.